This set is great! The cushions are very thick &amp; comfy &amp; are made out of VERY thick canvas type fabric! Not cheaply made! The back could be a bit higher but it's still taller than most sets I looked at! The center console with cup holders is great added bonus!! The fire pit is also bueautiful &amp; again not cheaply made! I did get the wrong one with my set but I loved the one they sent so Overstock made it right by giving me the difference in money between the 2! My family &amp; I love sitting on our furniture relaxing in the evenings,watching tv &amp; using the fire pit on our patio! This set gives you everything you need &amp; it's well worth the money! 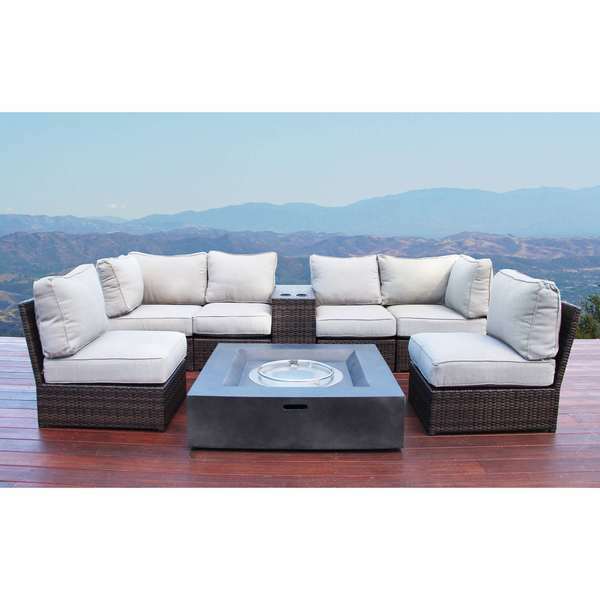 Warm up outdoor entertaining with this eight-piece fire pit lounge set. Thick cushions pad the seats for plush comfort, and the propane fire pit features a push-button ignition for automatic flames. Love This Set! Worth the Money!! "It doesn't seem to come with the set, but could one add a cover to the fire pit when it's not in use to have a full table? Not sure if the ring for the fire is higher than the sides, and thus impossible to lay a flat cover over. " Yes the ring for the fire is lower than the sides so it is possible to lay a flat cover over. "Can the fire pit be used as a table when the fire is on?" The fire pit can be used as a table when the fire is lit. It is designed with wide edges for drinks and plates. "How many pounds of Fire Glass is needed to fill the pit?" 30 lbs of Fire Glass is ideal. "Can a full butane tank be placed under the table or does it need an extension hose?" The fire pit is suitable with a 20 lb propane tank. The propane tank is external. The extension hose is 9 ft long and included in the box. "What is the fire table made of and is it sturdy? What are some the highth and width demensions of the seats?" The fire table is made of fiber reinforced concrete. It is a very durable material created to withstand the outdoor elements. The dimension of the fire pit are 42-inch diameter by 12 inches high. It is filled with 40,000 BTU on an external propane tank. "Can you re-configure this set & does the set come with the clips to hold each seating piece together?" This set is 100% modular and can be make into any configuration. There are sectional clips included in the box, which interlocks the furniture together. "Does the fire pit come with a cover that acts as a table?" This particular fire pit does not come with a lid. The edges of the Fire Pit has space to be used as a table for drinks and plates. It also comes with a protective polyester weather protection cover included.